An aerial view, over the ice, Greenland. Photographing from an airplane provides a unique perspective on the world. Some of the most abstract images I’ve seen were made from a plane. This is a photo of an immense landscape yet, scene from above, the image is less about space and more about shape, color and texture. By ensuring there was no horizon in this photo I’ve been able to challenge our normal perceptions of scale and space. 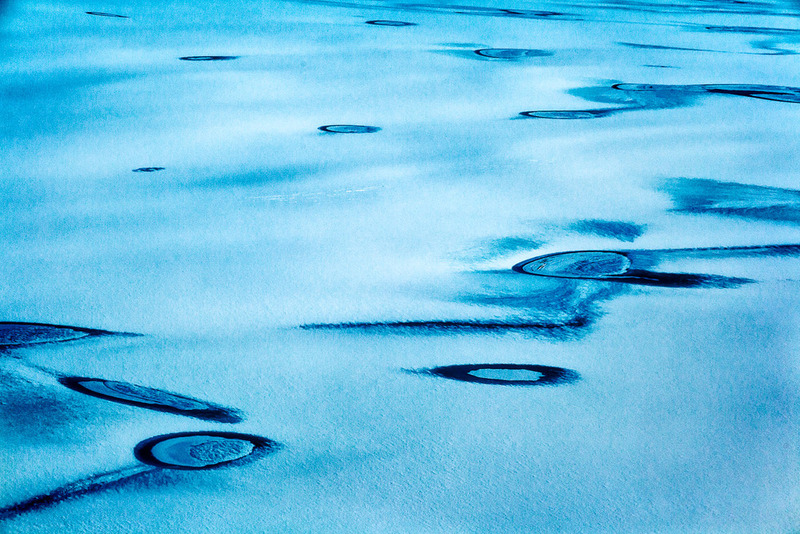 The circles are actually holes in the ice exposing the water below. It’s true to say that circles and the color blue are the dominant compositional elements within this image. In fact my very first full time job, at the tender age of seventeen, was in a camera store with retired professional photographer, Ernest C. Cameron. Old Ern, Mr. Cameron to almost everyone else, was still doing weddings on the side and I’d follow along, carry his bag and learn from this old Scottish gentleman. He was a wonderful man and a gentle soul. I was deeply saddened when he died. Even in his late sixties Ern was still doing the odd aerial job. He’d be taken up in a Cessna with the passenger side door removed. His chair would be rotated towards the open door and, with the plane banking steeply, Ern would be photographing, parallel to the earth below, with only a seat belt protecting him from the inevitability of gravity. You understand this is well before the days of Workplace Safety and the like. We’re talking old school photography here. Ern used to do this sort of work with an old 4”x5” Speed Graphic camera. Each sheet of film was 4”x5” in size and, to obtain maximum detail and critical sharpness, Ern would attach a high quality enlarging lens to the camera. How about that folks? I’ve never had quite that kind of adventure, though I’d be up for it. I have photographed along Australia’s iconic Great Ocean Road out of a helicopter with the door off. And that was, quite literally, a blast. I understand that, up until quite recently, you could do the same thing in New York. But the world’s a different place now and such activities are frowned upon. I’ve also photographed from a helicopter around Ushuaia at the very bottom of Argentina. That was great fun, though the doors stayed on that day. 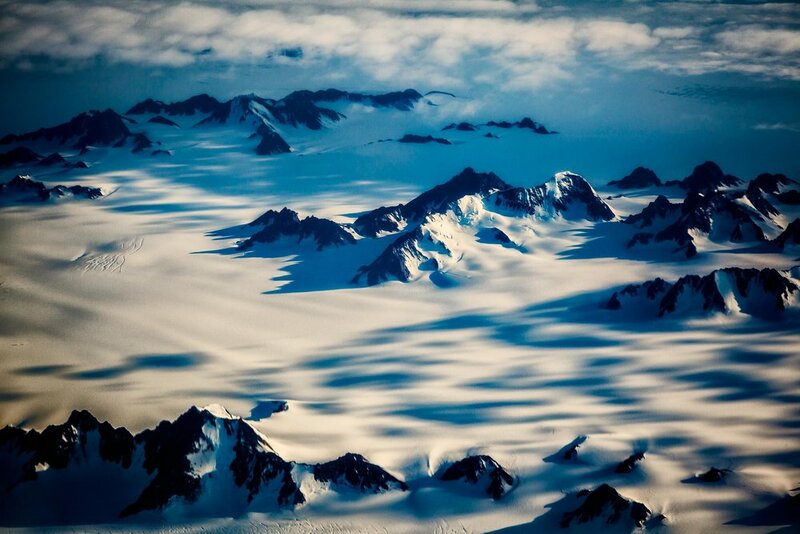 An aerial view of a snow covered, mountainous landscape made during a flight over Greenland. I made the photos in this post while flying over Greenland while on route from Iceland. Flying over Greenland really gives one a sense of just how wild this landscape is. And it’s mostly ice and rock, with very little foliage of any kind. As is so often the case when flying in a commercial jet, a lot of compromises are involved. You’re more often than not stuck in your seat with little or no opportunity to move around. But it’s the windows that you photograph through that provide the biggest challenge. They are a dense curved perspex which, more often than not, could do with a good spit and polish. Given the restrictions associated with photographing from a commercial jet, there are still some things you can do to improve image quality. And these tips can also be applied when photographing from a moving bus, boat or train. Because the earth and even the clouds are so far away you can achieve a large depth of field at a quite wide Aperture (e.g., f/4). However, if you want to include the aircraft’s wing in your image you’ll need to stop down to around f/8 or f/11. To reduce reflection move in really close to the window. Just be sure not to let your camera’s lens or any part of your body touch the window as the vibration will likely result in camera shake. If you live in or around Melbourne, Australia and you’re just about to head off on an adventure then you should consider a private and highly personalized one-on-one coaching session with me. Highly tailored to your own camera gear. Explanations provided in line with your level of photographic experience. Entirely based upon where you are going and the kind of photographs you want to make. I run these sessions all the time and they’re a lot of fun. It’s a great way to pack a lot of practical information into a short, sharp session. Your camera handling skills will dramatically improve, as will your confidence and willingness to experiment. And that, my friend, is the beginning of truly creative photography.